The method of classifying the tweets was to identify the source of the tweets, a device being either (Android, IPhone, Web Client, Blackberry or IPad), with the other devices making up to small a total to be considered. The next phase was to classify which party the tweet focused on and to make this as simple as possible, any tweet referring to a single part would be identified and tagged for the relevant party while any tweets mentioning multiple parties would fall into a separate group. 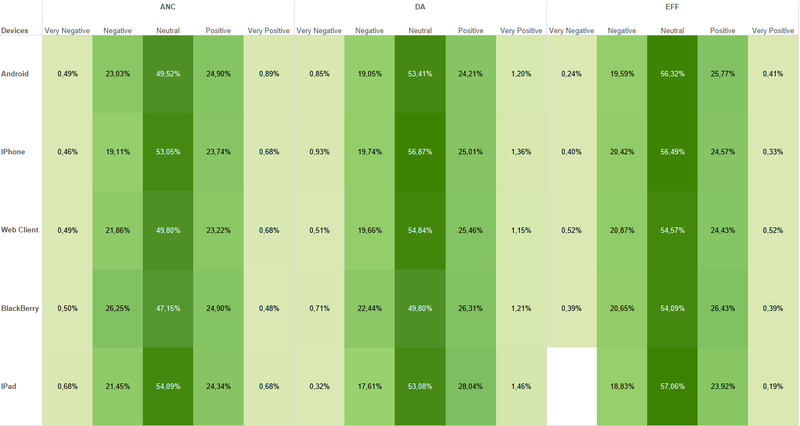 This allowed a simpler, more concise sentiment classification and allocation to parties. Looking at mobile device usage we see the following total tweets and their sentiment for the top 3 political parties (in terms of volume of tweets about the party). The below image shows the percentage of the total volume of tweets across all devices, parties and sentiment (All the percentages will add up to 100%). We can see that Android devices are the source of most of the tweets with the DA having the largest share of total tweet volume across all the parties. They also have the highest number of Positive tweets making up 5.26% from Android devices and 2.65% from IPhone devices both figures are larger than their alternative parties counterparts. IPad and Blackberry users are very small percentages of the total tweet volumes for any political party. However, this view limits more detailed analytics and needs to be changed to provide alternate views. 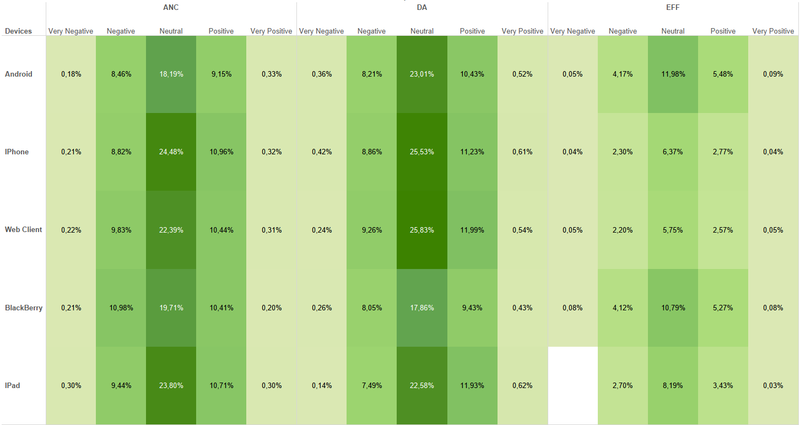 This image shows again the DA having the majority of positive tweets for Android, IPhone, Web Client and IPad with 10.43%, 11.23%, 11.99% and 11.93% respectively, while the ANC nudges ahead on Blackberry devices with 10.41%. Note that this is also the only device where the DA positive tweets are below 10%. The EFF sees a small presence in both total tweets and tweets per device with their largest share being on Android at only 21.77%. Due to IPad’s and Blackberry’s volume of tweets there doesn’t appear to be enough statistical relevance for either of these devices and can only be seen as slightly indicative of the twitter population. 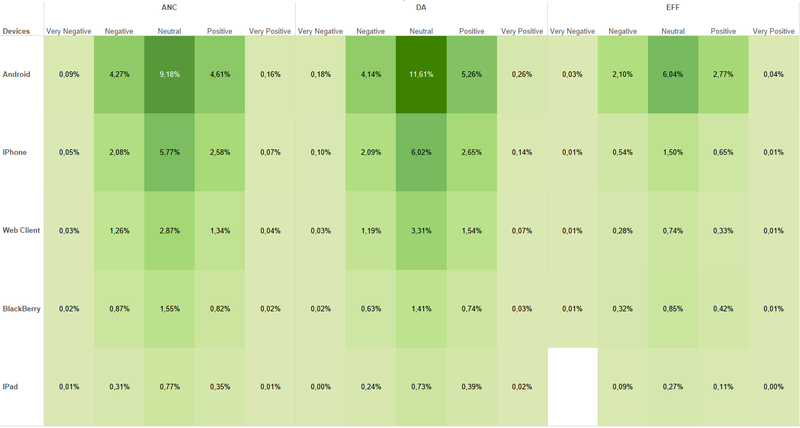 The DA also has the highest Very Positive tweets for both Android, IPhone and Web Clients while also having the highest very negative tweets. The ANC has the lowest neutral sentiment at 20.9% compared to both the ANC’s and DA’s 58%, suggesting ANC’s followers have either an underlying positive or negative sentiment to their party. The ANC has both the highest overall negative and lowest overall positive sentiment out of the three parties possibly suggesting their followers’ opinion? 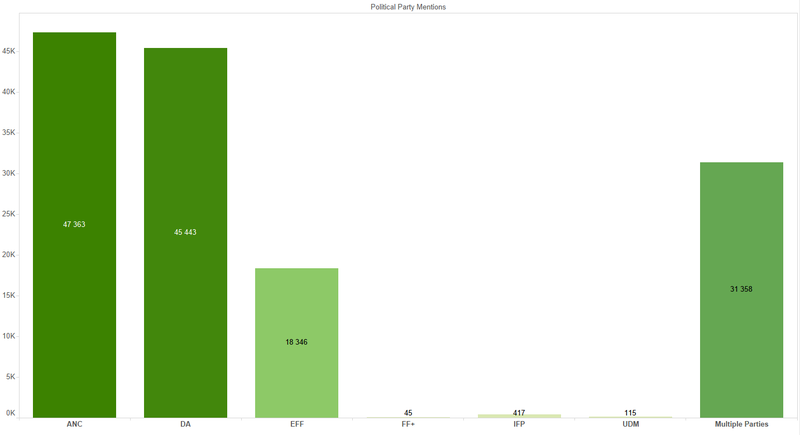 The EFF has the lowest negative and highest positive sentiment among the parties according to tweets about each party. This image indicates that the sentiments reflected for each party is not related to volume of tweets and further strengthens the analytical findings. The other parties did not receive enough tweets in the time period only mentioning that party specifically, meaning we would be able to classify and apply a sentiment correctly to the tweet.